Are you frustrated because not every team in your firm is hitting their goals or performing at their highest level? Unfortunately you may have groups that struggle to be profitable, have high turnover, or don’t embrace your firm’s culture. It can be difficult to hold remote offices and project leaders’ accountable, and even figure out what is going wrong. There are many options to attacking the problem of an underperforming team including replacing team leadership, closing a remote office, or other intensive measures. Very often an office is opened or a new team assembled in order to accomplish one of the firm’s strategic goals such as breaking into a new market, geography or client. Depending on how the group was created – from breaking off from another successful division, to an acquisition, to a key strategic hire, many things can cause a group or remote office to underachieve. In measuring the performance of our groups or teams, we often look at revenue or profit goals, but it is also important to understand the other key metrics behind the scenes that are causing the group to miss their primary targets. A variety of key metrics, such as win-rate, backlog and utilization need to be evaluated, as well as interviews with staff to see if any patterns or red flags arise. Financial problems often arise because of poor scope development, estimating practices and failure to manage project costs including overruns due to scope creep. Very often the organizational structure and compensation practices of your firm may actually be a big deterrent to good performance. I am seeing a trend with A&E firms to move away from an office-based Profit and Loss (P&L) reporting structure which can actually encourage the opposite behaviors that firm leadership is expecting. Remote offices or groups that primarily work independently are often not encouraged to share staff, cross-sell or provide work to other offices or groups when measured primarily on their own performance. Bonus plans are also often discretionary which promotes individual performance over the best interests of the firm. Another cultural problem resulting from the reporting structure, established cultural practices, and remote aspect is failure of individual teams to follow company processes and use their systems. Very often these groups develop their own ways of doing things, use a lot of spreadsheets to manage their projects, and fail to buy-in to the company strategy and vision. I have frequently heard these groups referred to as “fiefdoms.” This is usually the opposite of the type of culture the firm is hoping to inspire, and primarily a cultural issue stemming from a deficiency of training and oversight, as well as a lack of accountability and consequences for not adopting company best practices. This can have a significant impact on profitability and destroy the ability for the company to grow and thrive. These issues are especially evident when a firm has been acquired, and has completely different systems, processes and way of behaving from the corporate office. It can take a lot of time and effort to integrate a completely new company into your mainstream business practices. And when resources are tight to begin with, this can become an area that is not given enough attention. It is very difficult to transfer and maintain the culture from the headquarters to remote sites. The culture at the headquarters is often more controllable and in sync with the leadership’s goals because that is often where the leaders spend the most time. If possible, moving a top performing manager to a new office can have the best results. Bringing the discipline, values and knowledge of company practices to a new office is challenging, and having someone there from the beginning that already follows established processes and embraces use of systems may get the best results. In some cases, you may try everything possible and discover that a group, team or office is just not working out. So how do you know when to cut the cord? Obviously you want to try everything possible to turn things around, especially if you have made a large investment in them, and have a lot of talented staff that you could lose. In my book Find the Lost Dollars: 6 Steps to Increase Profits in Architecture, Engineering and Environmental Firms, I reveal six steps to increase profits in an A&E firm, and the same steps can be applied to transforming a group, office or team from one that is underperforming to one that is profitable and held accountable for financial results. Request a complimentary copy of the abridged version of my book to learn more. If after all of these steps have been taken over a reasonable period of time, and performance has still not improved, then there may not be any other option but to replace key staff or close an office all together. In many cases, the 80/20 rule will apply, and a few small changes can have big results. The key is to figure out what those leverage points are and make improvements quickly rather than let problems fester and deteriorate your business. Real improvement can be made with clear communication, determination to instill accountability at every level of the organization, and swift action to stop the bleeding. 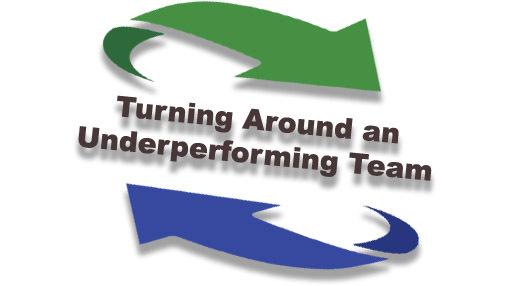 What has your firm done to turn around an underperforming team, group, or office? What strategies are our clients employing to help them preserve the firm’s culture and practices across the organization? Hi June, I agree with everything in this article, especially the two things that will absolutely lead to “real improvement, clear communication and determination to instill accountability at every level of the organization”. Above all other issues, it is my strong belief that the absence of these two organizational action items in any business culture will lead to many difficulties impacting the effectiveness, efficiency and financial stability of any firm.